Adventures in the Endless Pursuit of Entertainment: George is Beauregard Jackson Pickett Burnside, oh my! George is Beauregard Jackson Pickett Burnside, oh my! 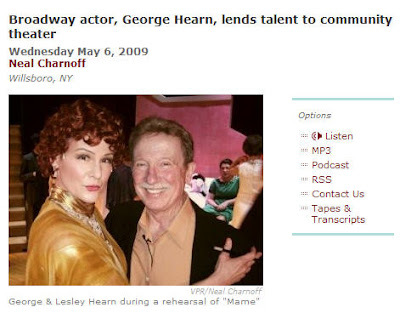 George Hearn is Uncle Beau in Willsboro Drama Club's production of "Mame" this weekend! As soon as I got the news, I immediately mapquested Willsboro, New York. Hmmm, it's kind of far for even for this Yankee who just had five weekends of traveling in a row, even if I did take Auntie Mame's horse Meditation, er Lightening Bolt. Aw, maybe I'll just stay put at Beekman Place this weekend. Sigh. I don't know. That could have been you in GH's arms.